If you know us, you know we’ll take any excuse to try on clothes. We host regular office clothing swaps, we can point you in the right direction if you need a last-minute outfit change before an event at the Green Building, and at least one of us worked in fashion before jumping over to the world of weddings. 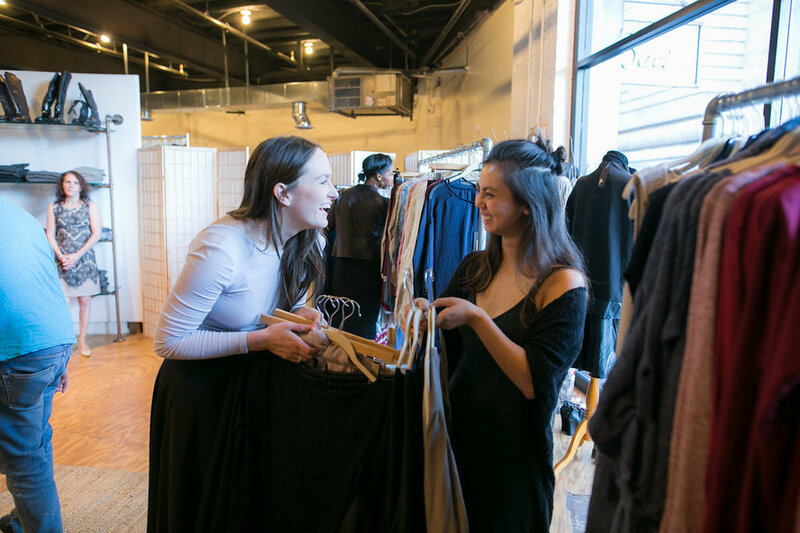 So when our team was invited to a private shopping event – the whole store open after-hours, just for us -- at the Baci Outlet in Dumbo, we were jumping for joy. The Baci Outlet is a year-round sample sale located at Italian womenswear brand Baci’s U.S. headquarters, featuring well-made clothing at wholesale prices. Think natural, quality fabrics, like silk, cotton, linen, wool and leather, and not a single item in the store is over $50. The girls from Baci greeted us with a bottle of bubbly, and we immediately got down to business. Cue 80s movie dressing room montage! We stocked up on simple, layerable sweaters for fall and found a couple of statement pieces hidden in the racks, like a pair of leather culottes Megan and Isabel scooped up. You may see a few #twinning 'grams from us soon. The Baci Outlet is located at 55 Anchorage Place between Plymouth and Water Streets. Since the outlet restocks every two weeks, there are always new surprises. When we were in they still had plenty of leather jackets, cozy sweaters and oversized menswear shirt dresses in stock. Baci is giving our readers an additional 10% off your entire purchase, so mention this blog post when you shop. And be sure to check out their Sip & Sample Shop event on Thursday, October 20th from 5pm – 7pm. We’ve got all the inside tips on what to ask during your tours and key points to take note of. Planning in a raw space is one of the best opportunities to create a personalized and unique experience. But having that much free reign can be hard to navigate at times. Calling all Gowanus mermaids and sailors: send your friends home with gifts from your favorite canal to commemorate your marriage on the beloved Superfund site. Brooklyn's wedding fair for modern lovers.